Promotional chip clip in the most popular four inch size for bag clips, memo clips or chip bag clips for promotion. The features of the four inch chip clip are heavy plastic molded construction with a internal steel spring. Rush Chip Clips Production is available on selected colors. The overall size of the clip is 4" wide x 2 1/2" high. 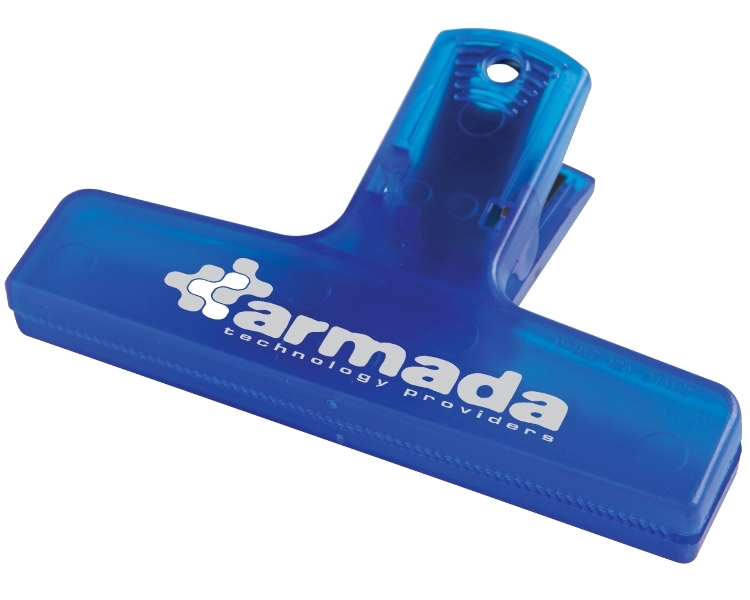 Price includes a one color imprint on one side in an area 3 3/8" w x 1/2" h.
Chip clips have a max of a three color print. Vendor to vendor all of them I used came up short. I had tried some of the imports previously from another (makes 6 total) of the companies and they did not hold up and the printing was not the best. Since we use 2000 clips a month I thought I would try PIIs 4 inch clip at 1000 units on rush service. Wow, what difference, delivered in little more than a week, high quality and great looking imprint. PII service and Made in the USA clips really impressed me. Oh, the price was right as well. Our company will be a lifetime customer!! !